MOPAC is a quality rendering facility that exists primarily to recycle the byproducts from the community to reuse for different purposes. Our drivers collect fat, bone, and grease from meat-packing plants, butcher shops, grocery stores, restaurants institutions and businesses ranging from northern Virginia to below Connecticut.These truck driving jobs are unique as a driving option that is not mired in long-haul weeks-long driving. The drivers run routes to customer locations to collect materials using both 40 foot trailers as well a 3 axle straight trucks and are both equipped with hydraulic bucket lifts.We collect used cooking oil using vacuum pumps, where the axle trucks are equipped to receive 55 gallon drums and the trailers are able lift and dump collect tanks using a hydraulic boom lift. The position is a physically active driving position where drivers are expected to move brutes and drums using handcarts. Drivers are expected to stay out only one or two nights a week in order to best utilize the load capacity of our trucks, but accommodations at hotels are provided. 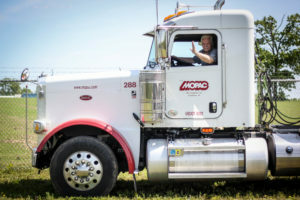 If you are interested in a driving position with MOPAC download the PDF application and fill out the form below for more questions or to start the interviewing process.